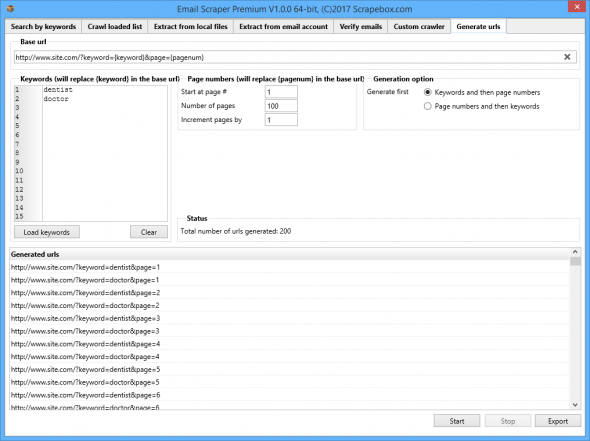 The Email Scraper Premium Plugin is a powerful alternative to the included ScrapeBox Email Scraper for email marketers who require more power and flexibility. Ranking your web site on search engines is becoming increasingly difficult, more and more internet marketers are turning to email marketing as a direct line of contact with customers. 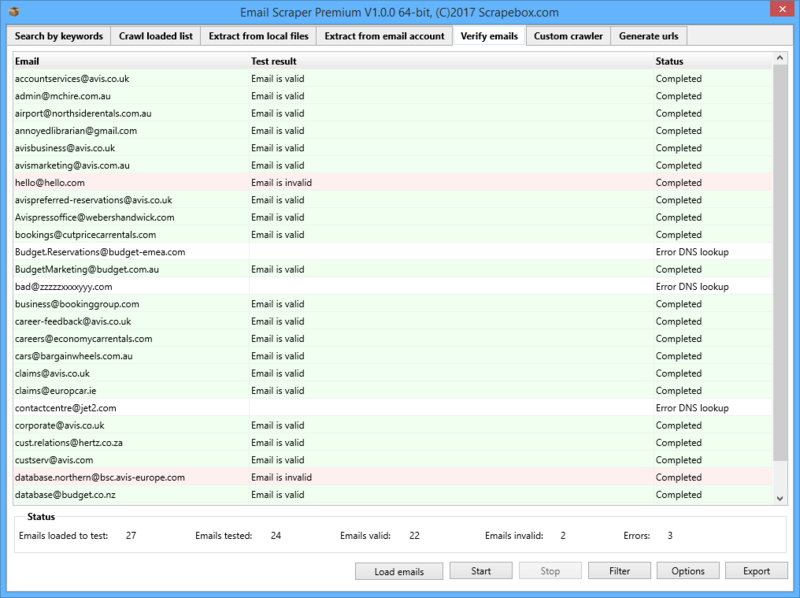 With the Email Scraper Premium Plugin you have to all the tools required to gather, filter and test emails in order to begin email marketing! 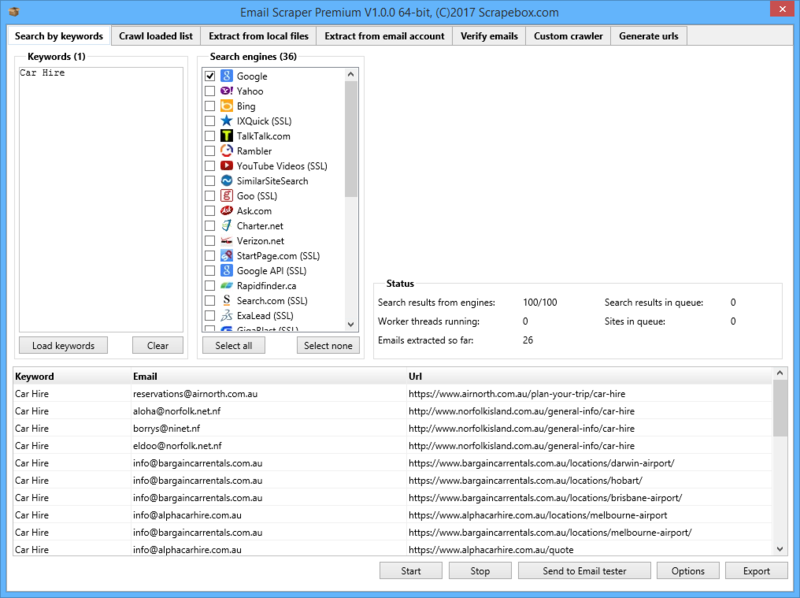 The Email Scraper will search your keyword on each of the selected search engines and then scrape all the URL’s in the search results. 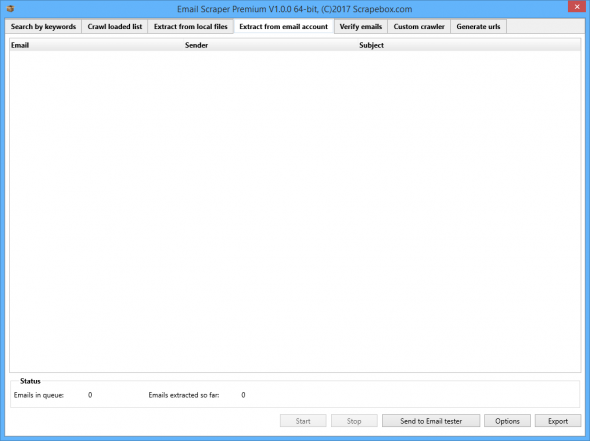 From there the scraper will then load each of the webpages and hunt for email addresses on the page, and when found extract the emails from the page and display them in the GUI. 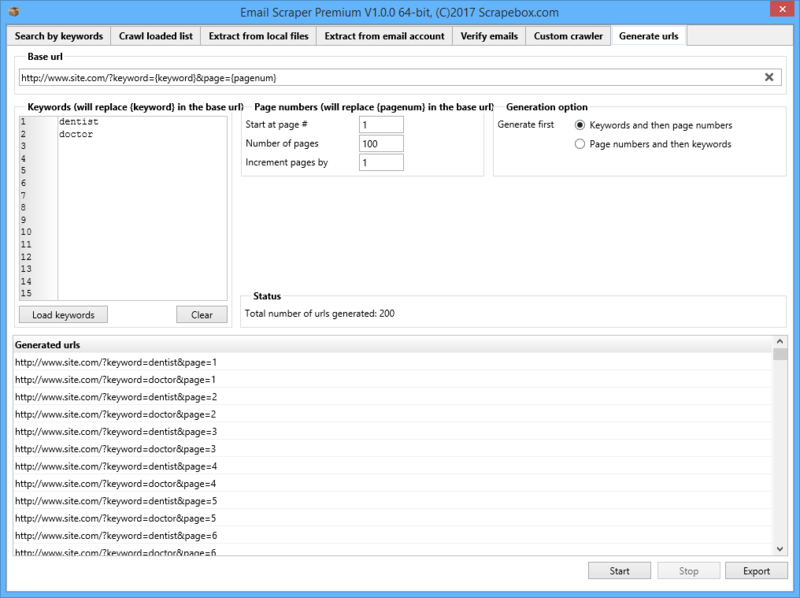 The Email Scraper will also save the keyword used to find the email address, along with the URL of the page the address was extracted from. The scraper is multi-threaded and very fast, making it possible to extract hundreds of emails per minute. There’s also numerous options and filters that allows you to customize the scraping process. You can search only pages containing a specific keyword or a number of keywords, you can also filter pages with “bad” keywords for example to avoid scraping emails from pages with unwanted content. It’s also equipped with an email address filter to avoid scraping emails with specific words or emails from specific domains. 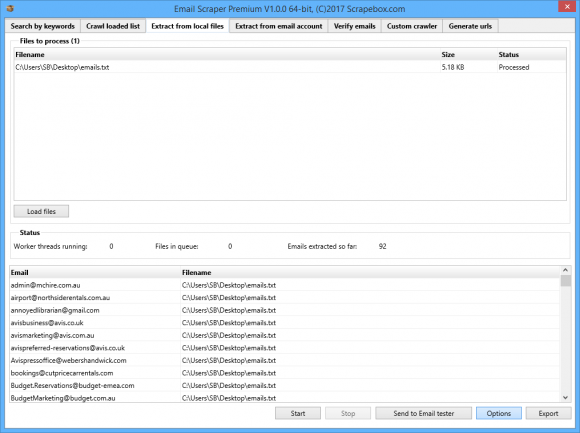 Additionally you can choose to only scrape emails where the email address matches the site being scraped, this can ensure scraped emails belong to the site and are not unrelated addresses from sites like Gmail or Hotmail. Do you already have a list of URL’s or sites you wish to scrape email addresses from? If so the Crawl Loaded List tab offers the ability to do just that! Just load your list and click Start, the Email Scraper will run multi-threaded and fetch emails from all URL’s in your list. Also it has all the same filter features as the Search by Keywords option. You can search only pages containing a specific keyword or a number of keywords, you can also filter pages with “bad” keywords for example to avoid scraping emails from pages with unwanted content. It’s also equipped with an email address filter to avoid scraping emails with specific words or emails from specific domains. 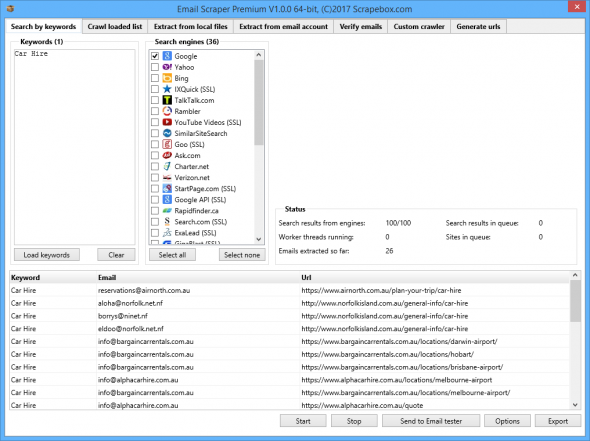 Additionally you can choose to only scrape emails where the email address matches the site being scraped, this can ensure scraped emails belong to the site and are not unrelated addresses from sites like Gmail or Hotmail. You can also set how many levels deep to scrape, for example if you load the homepage of a website and select 1 level deep the email scraper will visits the sites homepage and extract all emails from the page. At the same time it will also extract all internal links to other pages, then it will crawl all of those pages and extract emails from those pages as well. This deep crawl option can work up to 8 levels deep within a website. The Extract From local Files option lets you load thousands of text files at once, and with the click of a button extract out all the email addresses in to one list which is available to export as a Excel or a single text file. This has been a very popular request from users, the ability to extract email addresses from your inbox! If you have an email account containing hundreds or thousands of emails from other people, and you want to build a list of all their addresses then you will love this feature. You no longer have to login to your email account and click each email one by one, and copy the address from the “Sender” field or the message text. 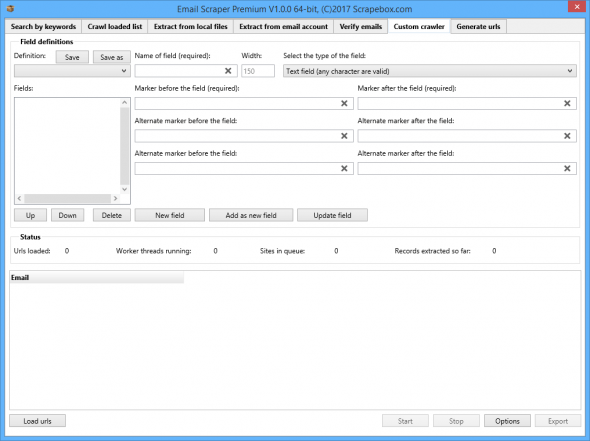 Instead simply enter your email accounts Pop 3 settings in to the settings window, and let the Email Scraper plugin do the rest. It will login, and then proceed to open each email and extract the email addresses from each email. On the Extract From Email Account options window, you are also able to select if you want to scrape email addresses from the message body or just the senders address. You can also choose to not download large emails, such as those with large attachments. Another very popular request from users, being able to verify a list of email addresses to filter out invalid or non-working email addresses. When sending emails you want to minimize the sending of emails to non-working email addresses and receiving too many bounced and returned emails. So the Verify Emails option is a very useful way to take a raw email list and check it for bad and invalid emails. The Verify Emails feature uses a multi-stage checking process which checks numerous attributes such as the validity of the domain, DNS and MX records to determine which addresses are working and which are able to receive an email. 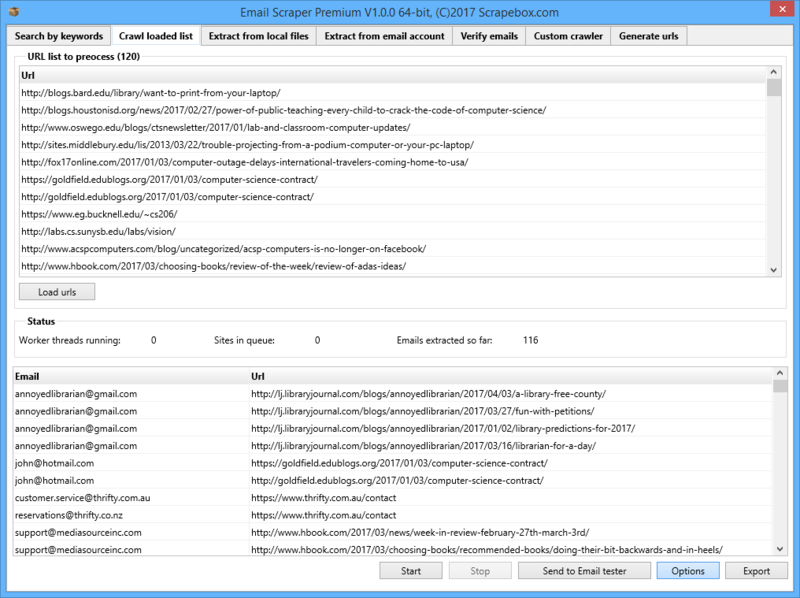 The Search By Keywords, Crawl Loaded List, Extract From Local Files and Extract From Email Account features all have a direct “Send to Email Tester” button to enable easy list checking. Note: The email verifier works with a high accuracy to clean email lists. However it’s impossible to verify emails with 100% accuracy without sending a physical email with tracking, and waiting for a real person to read the email. There are times when you want to scrape more than just email addresses, you want to also scrape the email address owners Name, Website, Phone Number, Postal Address or any other specific piece of data. The Custom Crawler is a versatile and customizable scraper you can train to fetch other pieces of information from sites with a predictable layout for example a Forum, Directory, Classifieds Sites, Social Networks etc. You are able to configure a virtually unlimited number of custom pieces of data to scrape just by adding what HTML appears before and after the data you want to scrape from the webpage. Many times websites like Forums, Directories, Search Engines etc have a predictable URL structure which may contain a keyword and incremental numbers for example www.site.com/?keyword=dentist&page=1 followed by www.site.com/?keyword=dentist&page=2 and so on. If you want to gather emails from all possible pages, the easiest way is to generate the list of URL’s with the incrementing page numbers. 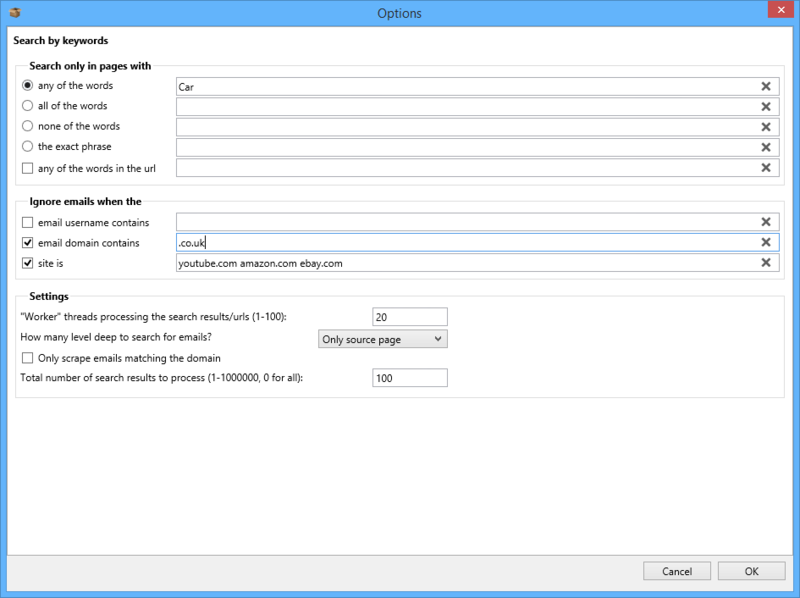 The Generate URL’s feature makes this simple to do and thousands of URL’s can be generated instantly which can be used in the Crawl Loaded list feature, or even in other tools! 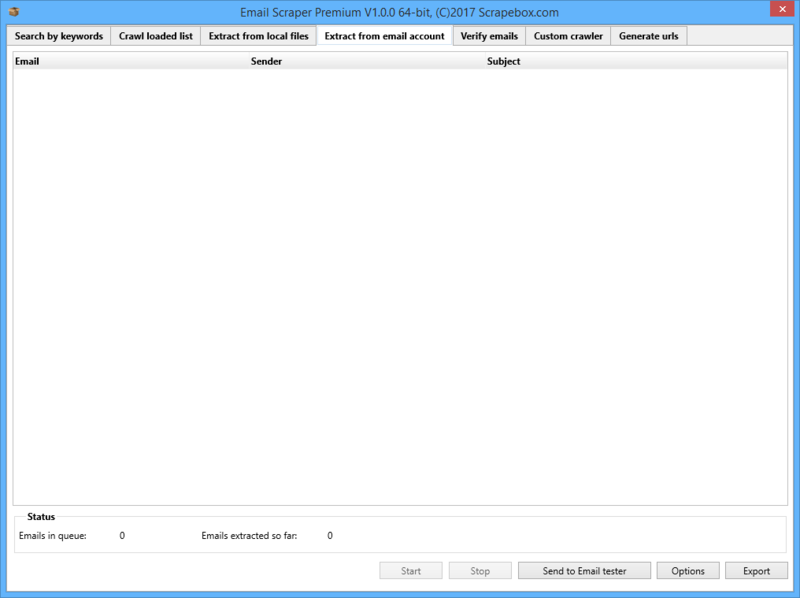 The Email Scraper Premium plugin is only available to owners of ScrapeBox, to purchase you must be running ScrapeBox v2.0 or higher to access the “Premium Plugins” option in the menu. From here you can select “Available Premium Plugins” to purchase, and to download after you have paid as well as download plugin updates. Also note the Email Scraper Plugin is a lifetime “per user” license, so if you have multiple ScrapeBox licenses registered to the one email address purchasing the Email Scraper once will activate the plugin for all your ScrapeBox licenses with the same email for life. The plugin is a one-time payment and is not a monthly or yearly subscription, all updates are free. View our video tutorial showing the Email Scraper Plugin in action. This feature is a premium plugin available from the “Premium Plugins” menu in ScrapeBox.